Some of you have asked me how My Buddy and I are enjoying the outdoors now that springtime is here. We're loving it! Last weekend we headed up to Mt. Vernon, Washington, for the 25th Annual Skagit Valley Tulip Festival. The flowers were beautiful and My Buddy and I had a great time. We both thought the view was breathtaking. Just look at the colors! Then some lady took a picture of us like we were some kind of freaks. Like you've never seen a guy and his armadillo at the Skagit Valley Tulip Festival before! Now I know how celebrities feel when paparazzi follow them around. Britney, I got your back. Later, I turned my head for just a second and when I looked back, he was nowhere to be found. I looked everywhere for that little guy. "My Buddy!" I yelled, "Where are you?" Luckily I found him after a few minutes. Here we are, reunited. 1. Almost getting into a fight over Choco Mountain with J. Douglas. I guess "Your Mom" jokes just aren't that funny to some people. 2. 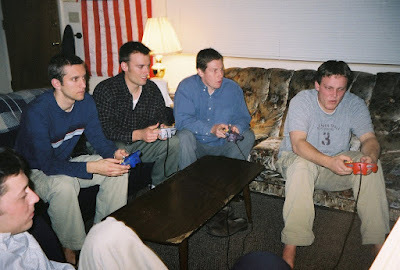 The semester our "friendly" upstairs neighbors stomped on the floor nearly every time we played. They were so rude! 3. The phenomenon called the "Tony Three Shell Salute" where the person in last place fires three consecutive red turtle shells at the third place player. This doesn't really help the last place player win, but it does hurt the third place player. Inspired by our Peruvian roommate, Tony Gonzalez. Unfortunately for him, it wasn't cleverly done out of spite but was a result of his inexperience and inferior driving. 4. 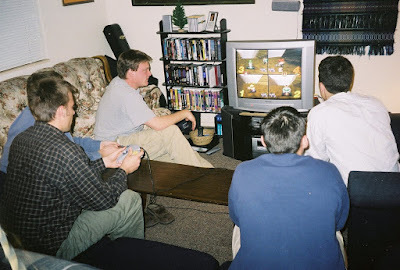 The time when half my roommates and other guys from down the street stayed up all night playing. Luckily it was finals week. Was this the night? 5. 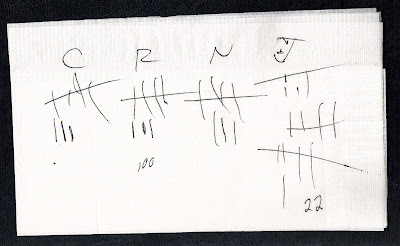 We would always say that the last race before bed decided who was "King for the Night." This race had to be Bowser's Castle and sometimes we played more than one race if the first one didn't have an exciting finish. Regardless of whether it was nighttime, the last race of the Mario Kart session always had to be Bowser's Castle. Hence, there could be a "King for the Morning," "King for the Afternoon," "King for the Hour Before Dinner," etc. Also, on the first lap of Bowser's Castle, Nate usually would say, "Looks like it's shaping up to be another classic Bowser's Castle." 6. The Aussie Finish. We watched the 2004 Salt Lake Olympics DVD once and noticed that in one of the short track speed skating events, an Australian who was in last place and very far behind the pack ended up winning because everyone else got tangled up and fell down right before the finish line. He skated past the tangled skaters and got the gold, only because he was too far behind to be tripped up. So, whenever that happened in Mario Kart we called it the Aussie Finish. Sometimes this would be accompanied by a song and dance with such lines as, "I come from Australia, the land down under, I love Outback Steakhouse, I drink Fosters, I have a pet kangaroo...etc." 7. 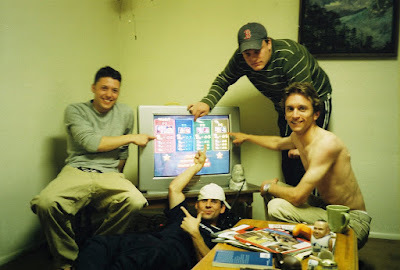 The time I was about to win an amazing Waluigi Stadium race and I stood up to celebrate as I came down the home stretch. As I did so, the Nintendo inexplicably spit out my controller and my car slowed to a halt as someone else passed me just before the finish line. 9. 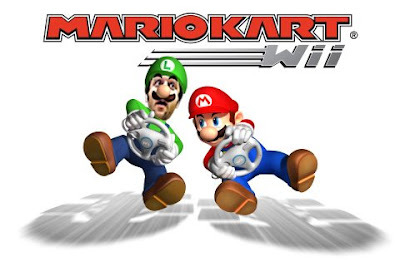 Sometimes we would play for so long that when we went to bed we would still see go-karts driving through the Mushroom Kingdom in our mind's eye. 11. 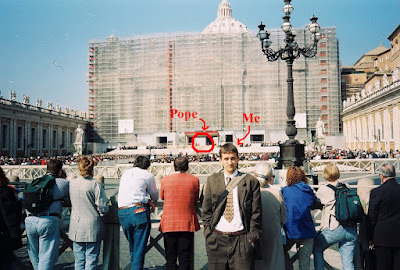 Once I went to Italy with a buddy for a month. On those long train rides across the Italian countryside sometimes we would talk about Mario Kart. Who wouldn't? He said he was really good but I had never played with him before. Of course the roommates let him play when we got back into town to see how good he really was. When we first started playing he he would laugh like Wario and say, "I'm-a Wario!" Then we destroyed him. And he stopped laughing. 12. Near the end of our last semester of college the new roommate who had never played Mario Kart before that semester, Tony Gonzalez, claimed he was better than me. I laughed and we played one Bowser's Castle to determine who was better (even though if he had won I was still better.) Obviously, I won. Then he claimed he was better than Nate so they, too, played one Bowser's Castle to determine who was better. Nate lost. I don't know what happened to that guy's shirt but it was an intense race. Ben won, due to a Star-Lightning combo on the last jump. He'll tell you it was a Star-Gold Mushroom combo, but we all know better. Favors! 14. This past February the old roommates (now almost 30 years old) flew from Seattle, Rochester, Washington DC, and Atlanta to Utah to get together for a weekend. We told our employers, friends, and families it was for a Super Bowl Party but we all knew it was really to play Mario Kart. Some say it was the greatest weekend of their lives. I won the last Bowser's Castle. King for the Year!!! The most common date for Arbor Day is the last Friday in April, but this varies from state to state. Arbor Day was started in Nebraska by pioneer J. Sterling Morton in 1872 in response to the lack of trees in his new home state. It is estimated that more than one million trees were planted in Nebraska on that first Arbor Day. 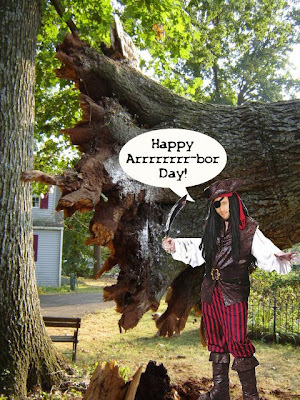 Arbor Day was named a legal holiday in 1885. 2006: I have no idea what's going on here. 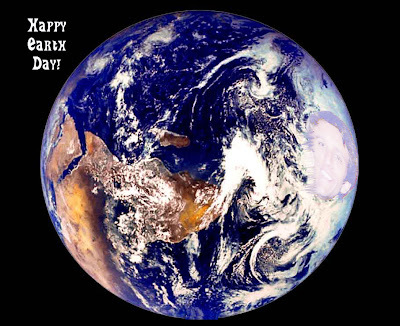 "Earth Day is a time to celebrate gains we have made and create new visions to accelerate environmental progress. Earth Day is a time to unite around new actions. 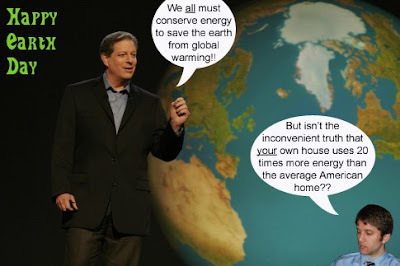 Earth Day and every day is a time to act to protect our planet." A local Subaru dealership is offering to plant a tree when you buy a car from them, or even test-drive one! 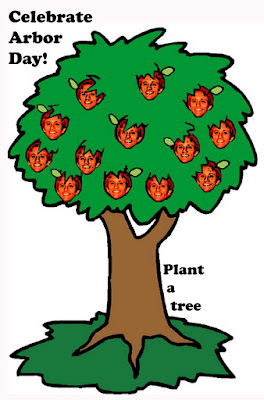 If you plant a braeburn apple tree in my yard, we have a deal. I heard those are really good. The mayor is offering a tax credit if you turn in your gas-powered lawn mower for one of those manual push ones. Good idea Mayor Nickels. That's sure to save the environment. You are fined $50 by the City if you don't recycle properly. I stick it to the man by not washing out my milk and juice cartons. Take that! The mayor is contemplating a $.20 tax for each plastic or paper bag you use at the grocery store instead of bringing your own reusable bags. Big deal. Italy's been doing this for years. Except they do it because socialism isn't free. Bike riders in the local annual Solstice Parade paint their bodies and ride naked and people bring their families to watch. Finally, an activity the whole family can enjoy. The Earth Liberation Front burned down some mansions because they weren't built "green" enough. Hint to everyone: just put the word "green" or "hybrid" in front of anything and people in Seattle will think it's good for the environment. 2006: If you don't get it, click here. Or read current events. 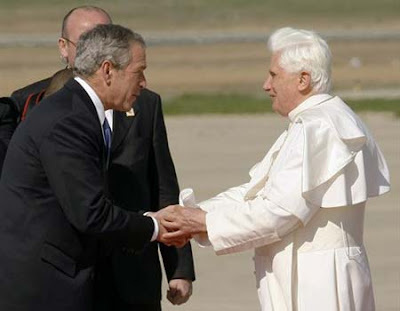 I'm a little offended you didn't invite me to welcome Pope Benedict XVI with you at the airport on Monday. You even invited your daughter, Jenna. 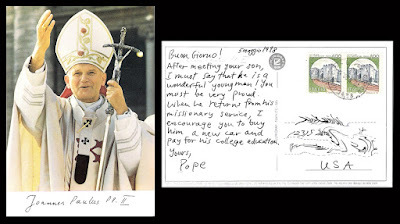 Here is the Pope in the Popemobile. 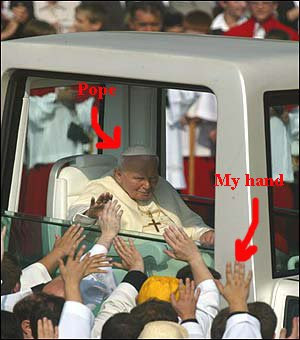 Have you gotten a high five from the Pope? So you see President Bush, I think next time I should be invited to the big airport welcome party. P.S. When is my tax rebate coming? 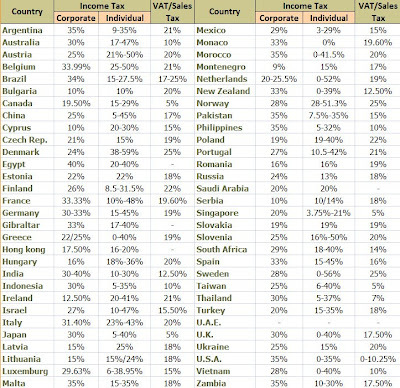 If you think you have it bad paying income, property, and sales taxes, check out our European friends in the world tax table below. What a bunch of chumps! On the other hand, I wouldn't mind moving to the United Arab Emirates. 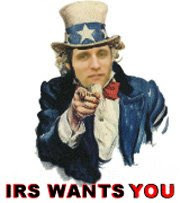 No taxes, plus they have year-round indoor skiing! My favorite part about the government-issued tax rebates this year is that the IRS spent $42 million to send notices in the mail telling people they were getting a tax rebate. How about you just pay me half that and I'll announce it on Oh Pepper? That'll get the word out. 1. Backpacks on wheels. You see these on campuses everywhere and they are so cool. It makes me feel like I'm walking on a tarmac. 2. People who write checks in the grocery store (or any retail establishment). Especially when they don't start filling anything out until the end of the transaction. 3. Traffic lights that turn red even no one is coming from the other direction. Or the ones that are set on a fixed timer and stay red, even at times of the day when no one is coming from the other direction. Or the ones that have separate left turn arrows that stay red even when no one is coming from the other direction. I get so cheerful in these moments. 4. When the Nintendo cheats. The other night I was playing the Legend of Zelda. I was about to die so I quickly pushed B so Link would drink the medicine, but the stupid witches shot me with their rays even though I know I pushed B first. 5. Driving around parking lots forever to find a spot up close. I've done some simple calculus differentials to determine that it's definitely not faster to park in the first spot you see and walk. It's much better to drive for ages up and down the lanes until you find that perfect spot up close. 6. Bad grammar. Its hard to use that pesky apostrophe correctly. 7. 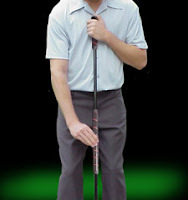 Chest-putters in golf. Whenever a pro misses a putt on TV and he's using a chest-putter, I say in my head, "I'm surprised you missed with that putter. You look totally cool using it." 9. Fake words like "ginormous," "preggers," and "anyways." 10. Comic strips way past their prime like Garfield, Peanuts, and Family Circus. Somehow after all these years it's still hilarious when Garfield eats a whole pan of lasagne. 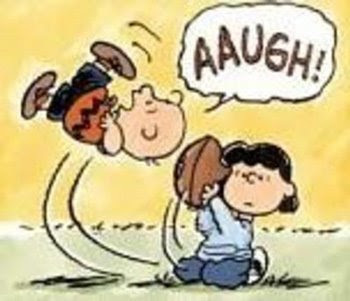 And I still think that just this once Lucy isn't going to pull the football out from under Charlie Brown but then she does. Oh Lucy, you're so tricky! 11. 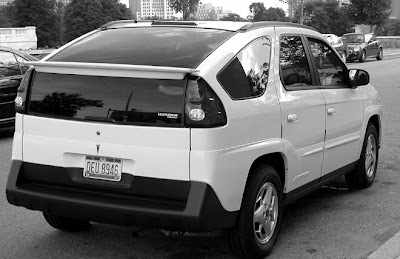 The Pontiac Aztek. The reason people sit down and say to themselves, "Well, it's time for a new car. Obviously my best option is the Pontiac Aztek" is because it comes with a tent. 12. NASCAR. Thank you ESPN for making it so accessible. 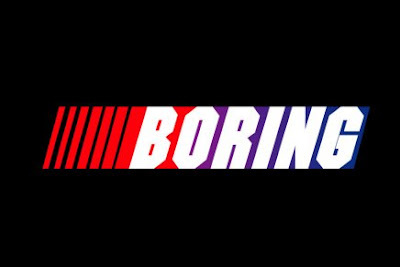 I just love your NASCAR version of Sportscenter called Nascar Now. Car racing is a real sport with real athletes and deserves full coverage by a real sports network like you. 13. Mixing fruit with meat. Those two food groups go perfectly together. Hawaiian pizza is the best example of this. How could you prefer a good ol' cheese and pepperoni pizza over that? Obviously it was invented by people used to cooking a whole pig with an apple in its mouth. 14. Big trucks. They're so polite when they share the road with my little Civic. 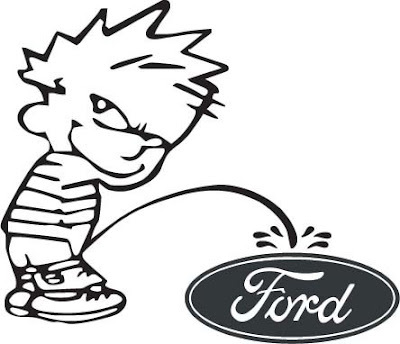 The only thing better than big trucks is those fake Calvin and Hobbes stickers on big trucks that show Calvin peeing on the logo of the rival big truck manufacturer. Now that's a sign of true class. 15. Musicians who share their political views between songs during their concerts. For my very overpriced concert ticket I get to hear your music AND your opinion on whether or not the U.S. should be in Iraq. Badly Drawn Boy, you know what I'm talking about. I am pleased to report that my pledge drive has gathered a total of $1 in donations over the past week. So, with great excitement, I am happy to announce that Oh Pepper? will be around for another year (it turns out maintaining a blog isn't that expensive, after all). Thank you to all who participated in this year's fundraiser. 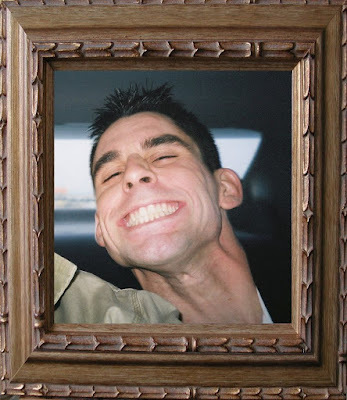 Instead of giving a free tote bag to the most generous donor, I am posting a framed picture of him so all internet users will know of his giving ways. Thank you, Reed. Your the best. Goodbye, blog readers. Sadly, Bear Stearns isn't the only casualty of the stumbling economy, bursting housing bubble, and weakened U.S. dollar. The extensive research projects, unbiased scientific polls, professional-quality Photoshopping, studio-produced music videos, in-depth editorial essays, and peaceful demonstrating you find on Oh Pepper? all cost money. 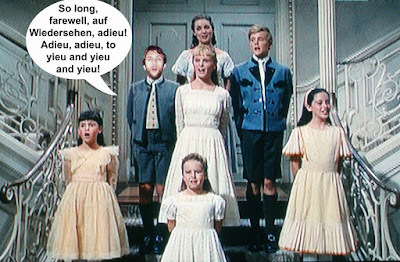 Alas, even Oh Pepper? has been hit by the rising consumer index and prices at the pump. So, the day has come that Oh Pepper? can no longer survive without support from you, the loyal readers. Luckily, I've calculated that if each of the thousands of daily readers donate just $1, Oh Pepper? can stay afloat another 12 months. Think of this as a PBS pledge drive, except you're getting better entertainment without the free tote bag. To donate, just log into Paypal and pledge your donation to account: (my last name)@yahoo.com.